Even the best fitting dentures will have problems. From the onset, your chewing capacity is cut in half. Because they’re not secure, food gets under them, they slip and can sometimes even fall out. The worst, however, follows years later. Once your teeth are removed, your body begins to reabsorb the minerals that are normally used to build up the roots of your teeth. After a decade or so, your jawbone will be so depleted that it will no longer be able to support your dentures. In essence, you become a dental cripple. This is known as facial collapse. Fortunately, there is a solution—Implant Overdentures. Using a hybrid of dentures fixed to your jawbone with dental implants, you’ll have secure dentures that don’t move. Plus, they’ll be no need to worry about facial collapse. Your body interprets the implants as teeth roots, which means it will retain all the necessary minerals in your jawbone to keep them nice and secure. After the implants are surgically placed, you’ll be given some time to heal from the surgery and to allow your bone structure to form around the implants. This is known as osseointegration. 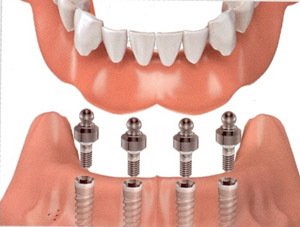 When that is complete, the restorative overdenture will be placed on the implants. In some practices, you would have to go to another clinic for the surgery. When you’ve got two doctors working on your implants, it can lead to miscommunication. The implants have to be placed precisely in order to fit the restorations. Fortunately, that is not a worry at our clinic. Dr. Rothwell is highly qualified to do the both the surgery and restoration. As a fellow at the International Congress of Oral Implantologists, she not only has significant training in implantology, but has demonstrated many successful cases. You’ll be in safe hands. If you’re needing implant overdentures, you may call our office to schedule an appointment. If you prefer, you may click here to request an appointment online.